On 22nd July, Ofgem contacted us and some other suppliers, to let us know that Iresa would cease trading and their license be revoked from 27th July. They did this to find a Supplier of Last Resort - the supplier that would best be able to take over another supplier’s accounts in the event of them going bust. You can read about the Suppliers of Last Resort here, which explains the guidelines Ofgem has put in place. Once this was publicly announced, Ofgem appointed Octopus Energy as their Supplier of Last Resort at 11pm on 30 July, meaning that we would take over the account of every Iresa customer, including being responsible for any credit balances. We committed to informing all customers by the end of the working day on 1st August. On the morning of 31 July, Ofgem passed us the data of everyone they believe to be an Iresa customer. By Wednesday, we'd uploaded all of this data to our platform so we could begin the process of assembling new accounts. We briefed all our staff and started the mammoth task of creating an account for each of these 95,000 customers - a job we'd completed that same evening. At 5pm on 31 July, Ofgem publicly announced that Octopus Energy would be stepping into the breach, and we (quickly!) launched www.octopus.energy/iresa, so Iresa customers could get information on what was happening to their supply. Keep your eye on this blog, as we’ll be updating it regularly with further information! By Wednesday, we'd uploaded all Iresa's customer data to our platform so we could begin the process of assembling new accounts. We briefed all our staff and successfully created accounts for each of these 95,000 customers, a colossal task we'd completed just a day after we received the data from Iresa. By the end of the day, we emailed every Iresa customer, and extended our phone support line to 8pm so that we could answer any questions about the change. We also met with the administrators (Deloitte) and Iresa senior management at their offices in Nottingham, to discuss how to make the transition as simple as possible for customers. We also met with the Energy Ombudsman to discuss the process for managing ongoing disputes.We are now working on analysing the data we have been given and build the technical structure necessary to operate as the energy supplier for Iresa customers. On 2nd August, the temporary team brought on to aid in the Iresa-Octopus transition were inducted and trained up on the basics of our processes by experienced members of our team. Over the course of the day we received emails and calls into the thousands from Iresa customers, averaging an email response time just under two and a half hours across our whole customer base, with an average call wait time of less than two seconds. It quickly became apparent that Iresa's data on customer accounts was in a real mess, full of inaccuracies. We received many emails and calls from customers who had either moved away from Iresa within the last few months or who'd moved house and were no longer responsible for that property. 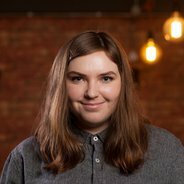 In response we have updated our FAQs so that people can get the answers that they are looking for. Over the next few weeks, we’ll work very hard on ensuring the accuracy of all information that we hold on former Iresa customers as much as possible. We also touched base with Citizen’s Advice to discuss the themes coming though in customer queries, and adjusted our messaging and staff training around this. Finally, together with the administrators of Iresa; we discussed what information we need from them to make sure Iresa customers receive accurate final bills. The 3rd August was another busy day, marking the day that all Iresa gas meter points were registered with Octopus on Xoserve, the UK’s central data service provider for gas meters, which is great news. Electricity works a little differently. It's slightly more complicated, with a greater number of moving parts for us to coordinate before this process can be sorted out. We’ve spent the past few days discussing with different industry partners how we are going to take responsibility for that supply. As you have probably gathered on this blog, we’re extremely aware that Iresa customers have gone through a very hard few months with their old supplier, and it’s really important to us that they experience something completely different with Octopus Energy. Part of this is going through customer emails, understanding the real pain points, and how we can give people the information they need in a way that is easy to understand and personal to them. It’s worth emphasising that we’re aware that many people switched away from Iresa before they folded, and those people will stay with their new supplier rather than be switched to us. Part of the process we’re going through at the moment is finding out which customers closed their accounts but are still owed money. We will pay these people as soon as we have a full understanding of the exact balances. We’re continually checking in with Ofgem to see how things are going, and now have a broad understanding of how many customers had debits and credits with Iresa when they went into administration. We’re having continuing conversations with the administrators to make sure the transition with payments is as smooth as possible. On Saturday, we forged ahead with our planning, turning our focus to working out the best approach to transferring credit and debit balances over from Iresa to Octopus. We began shuffling the customers into different categories based on their status with Iresa at the time of switching to us, e.g. those who'd already begun switching away and were left with a credit balance, those who were still being supplied by Iresa with a debit balance on the account, etc. All eyes were on our next big email update, which we're aiming to get out to all Iresa customers by Wednesday morning. The status of this largely hinges upon whether we're able to take actual meter readings from these switching customers to use as handover readings, rather than relying on estimated readings. Working out an exact point in your supply at which one supplier takes over from another is a little tricky at the best of times. Your handover reading is an independently-validated meter reading establishing the point your old supplier stops billing you, and your new supplier starts. We've delved into the nitty gritty of this process here. The main challenge for us in the case of Iresa's customers is that we don't have all the meter technical details we'd generally have at this point, and so can't validate the readings we receive via the usual processes. We’re now getting to the stage where we can begin to contact Iresa customers with next steps. By tomorrow morning (Wednesday 8th), customers should get an email about taking meter readings, along with information about their online account, when we’ll receive their account balance information and when they can switch from Octopus Energy if they so desire. The email will request a meter reading in the next five days. If you provide one, we’re hoping to be able to use this as your final Iresa reading, and your first Octopus Energy reading. On Monday, we expect customers will begin to receive their final electricity bills from Iresa. We are waiting for up-to-date readings from Xoserve regarding gas usage, although if these aren’t available, we’ll use your previous usage history to estimate one. We know some people have moved into an Iresa-supplied house during this time of change, and if you did so after 1st August, we’ll set you up with a new account the same as we would any Octopus Energy customer. If it was before 1st August, it’s going to take us slightly longer as we need to process these in bulk - but watch this space! We’ve now sent out an email to all Iresa customers, so if you haven’t seen it, check your spam folder! We have tried our best to not email anyone who has already told us they have already moved out or are no longer with Iresa. Please contact us if you’ve received the email and you don’t think you should have. Everyone else, this email should give a better idea about next steps, including meter readings, your online account and account balance information. On Thursday, we spoke to the Ombudsman about how the c.700 open Iresa complaints will be dealt with, and will collaborate with them to work out next steps for each case in question. We’re working with the existing Iresa team to resolve these as soon as possible. We’ve found that the Ombudsman complaints fall into three categories: the customer service Iresa customers experienced, transfer issues, and billing issues. The first two have essentially been addressed by moving the accounts to Octopus, and we’re now working on those customers with billing complaints. We’re taking steps to get these sorted, and have already received a huge quantity of meter readings from Iresa customers, which can be used to work out final balances. There’s been further discussions regarding complaints, as we’ve been speaking to the Citizens Advice Bureau’s Extra Help Unit to begin the process of handing over open Iresa complaints to them. Meanwhile, our tech team at Octopus is working with Iresa to upload customer account balances to our own system. This means that by early next week we’ll be able to send out a test email to a handful of customers. The email will state the balance of the account, and give customers a chance to click to tell us if they think it’s wrong. A handful of our most experienced team members are also working with Iresa, looking at the more complicated billing issues on a case-by-case basis. 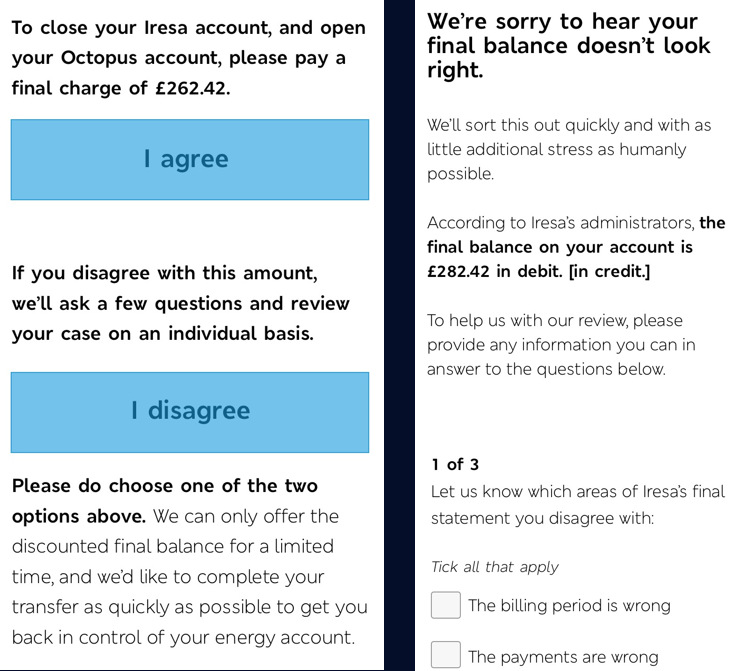 This includes looking at the full account history and correspondence, comparing what the customer believes is the status of the account, what Octopus believes and what Iresa believes. This will ultimately allow us to come to a consensus regarding each account. We are aiming to email out the majority of final bills (showing debits or credits) at the beginning of next week (20 August) and have just started sending out small batches of these to test our processes as the bills are handed over from Iresa systems to ours. Our team are working this weekend to pick up any responses and improve the process before we start sending bigger batches next week. Thank you to the 40,000 Iresa customers who have given us meter readings to help with that process. If you weren’t able to, don’t worry, we will use an estimate. By midnight tonight we'll have sent final bills to around half of Iresa customers, with the others to follow over the next couple of days. Iresa had some systems challenges, and it was never built to do what was needed over this process, but their technical experts have been fantastic, working with ours seven days a week to resolve as many issues as possible. However, when we send out the final bills we'll include a simple form for customer to tell us if they do think it's wrong and also the reason for that. We will look at each and every one of these in detail over the next seven days and come back to each customer. Since our last update, over half of all final bills have been sent to Iresa customers. Thanks to all who've used our nifty email feature to either accept, or dispute, final account balances. We're working through any billing discrepancies and will be in contact soon if that's you. If you're still waiting on your final bill, it'll be coming in the next few days. Our team are working really hard on this. We’ve got upwards of 60 people working full time on customers transitioning from Iresa to Octopus. Over the past week, we've helped thousands of customers, answering calls in under 90 seconds on average, and responding to emails at a median of three hours. We have now sent over 70,000 final bills to Iresa customers. Thank you so much to everyone for your patience. Many of you have got in touch to say that you had a very challenging experience with Iresa, we are doing our absolute best to make this experience as smooth as possible. Thanks for those who have said kind words about what we've been doing so far, especially those who came into this process disheartened by what had gone before, and who bore with us whilst we sorted it out. A shout out in particular to the gent who came from Reading to visit us in London and share his Iresa story and the one who corrected his previous calculations on his final bill and contacted us again to advise that actually, he actually thought he owed some money, and not vice versa. If you haven’t received your final bill, we’re working through it at the moment and aim to have it out over the next few days. Please make sure you check it carefully - if you aren't happy with the amount then 'Disagree' and we will look into it for you in detail over the next 7 days. As we hurtle happily towards the bank holiday weekend, we’ve now sent out over 75,000 final bills to Iresa customers. Thanks to those who’ve clicked ‘Agree’ to the final amount (either credit or debit) so it can be transferred to their Octopus account, and also those who clicked ‘Disagree’ and are working through any issues with the data with us. We appreciate that many people had very challenging experiences with Iresa, and are owed money and it’s been great to help so many people over the last few weeks. Just to remind anybody who is still waiting for a final bill - any credit balance you might have is protected, and you will get it back. We will still be working over the three days of the bank holiday weekend to generate the remaining bills and respond to any customer enquiries, so if you haven’t heard from us, please bear with us and you will do. It’s been just under a month since we were entrusted with all 90,000 of Iresa’s customers and we’ve got just 15,000 final bills left to send out to those customers who were still on supply when Iresa went into administration at the end of July. We have a large full time team producing these bills as quickly as we can, but some of the data we're working on with Iresa is quite messy, and we're having to work through manually in many cases to fix errors that arise. Thanks to everyone who is being incredibly patient with this quite complex process and any errors which the data may throw up. And just to remind you, that if your final bill doesn't look right, you can ask us to review until it does. We also now have a different team working on first bills for those who have been with us for nearly a month - welcome to Octopus Energy! And if you were an Iresa customer who switched away before 1st August, we’re working on your bill too with the administrator, but it might take us a bit longer to get this to you. Good news for those of you who switched over to us from Iresa on a prepayment meter: we've published a handy information page to answer all of the burning questions you might have about your supply. We’re almost finished sending out final bills to Iresa customers who had an active account when Iresa went into administration, with around 10,000 left to issue. So, what’s the hold up? Roughly half of these haven’t received a bill yet because they switched meters at some point during their time with Iresa (perhaps replacing a broken meter, or getting a smart meter installed). The meter switch complicates their billing process, meaning we’ll take a little longer to work out charges and close off the accounts. If you're still waiting on a final bill, and the meter switch situation doesn't apply to you — we’re working on the final bills for the remaining few thousand of you now. By the end of the day today we expect to have sent out another 1,000. We’re also working on getting final balances back to customers who switched away from Iresa some time before the company went into administration. This might be you if you’re up and running with a new supplier now, but were still waiting on a final bill, direct debit, or credit refund when Iresa went bust. We only have the details of a portion of these customers. We’ll be contacting them to request bank details shortly. If we owed them credit, we’ll organise their refund. If they owed money when Iresa went bust, the Administrators will be picking this up. Iresa will send us details of the rest of the customers like this soon, so we can action and close these off too. By the end of this week we’ll have issued 97% of final bills for people who were Iresa customers when the company went into Administration on 31 July. The final 3% are predominantly customers who had their meters replaced during the time they were a customer of Iresa. These replacements often weren’t registered correctly by Iresa which has led to a lot of difficulty producing clear, accurate bills. We’ve been working on designing and building a brand new system to produce final bills for this patient 3%. If that’s you – your final bill should be out in the next week. After that, we’ll be focusing on final bills for customers that had left Iresa before 31 July. If that was you, and you’re in a rush to get hold of your final bill, please drop us a line and we’ll try and speed things up for you. If you’ve received a final bill, and your Iresa account is now closed, you can relax into our tentacled embrace. We’ve sent you an email welcoming you to Octopus, with everything you need to know about us. Please explore the cool features of your online account, from our meter reading wheel of fortune to our “Refer a friend” scheme, and learn more about us on our blog. The email outlines our rather unique billing system: we provide you bills when YOU ask for them. To receive a bill, just submit a meter reading (and spin the wheel…). We’ll send you a bill within 24 hours.